This blog was written by one of Robert Burns Birthplace Museum’s Visitor Service Assistants, Jim Andrews. The site [of Burns Monument], which is within half a mile of the Poet’s birthplace, was in every way an eminently appropriate one, though it was years afterwards marred by the erection of Alloway Church close to the Monument precincts, which still blocks the view from the principal line of approach. The Monument would be a beautiful feature in the landscape from this point of view, and seen at a favourable distance, and as the view from all other directions is circumscribed, one cannot help wishing the church in some other place where it would be equally convenient and useful, and where it would not be an eyesore to all enthusiasts of Burns. Burns monument was completed in 1823: Alloway Parish Church in 1858. If he were alive today, I wonder if the church might have redeemed itself in Mr. Ewing’s eyes, as it now contains a feature that some visitors to the museum have asked me about and seem very keen to find: the Robert Burns Memorial Window. It is a modern stained glass window, installed in the church in 1996 to mark the bicentenary of the poet’s death. 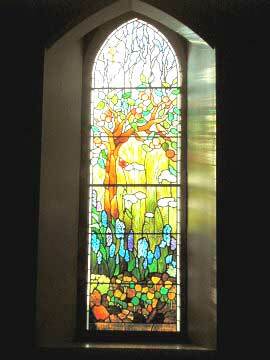 The iconography of the design, by the stained glass artist Susan Bradbury, is immediately obvious to Burns enthusiasts: the River Doon and the Brig o’ Doon, a ploughman walking behind a horse-drawn plough, various animals and plants that feature in Burns’s poems and, appropriately for a church, it also features the text of the first verse of Burns’s A Grace before Dinner. The church is also worth a visit for its other stained glass windows. With windows dating from the original building in 1858 through to the 21st century, it contains a history of Scottish stained glass in microcosm. The story of the stained glass we can see in Scottish churches and cathedrals today starts with, at least from a heritage point of view, a disaster ― the Protestant Reformation of 1560. The violent and thorough iconoclasm of the Reformation deprived Scotland of the bulk of its heritage of the religious art of the Middle Ages. Not only the art, but also lost were the traditional skills of the artists and craftsmen, who found that they could no longer earn a living as they had done during the centuries when the church meant the Roman Catholic Church. The Reformation Kirk was an altogether plainer affair that did not require their particular skills. Robert Burns may never have seen a stained glass window in a church. The Gothic Revival that began in the late 1700s and flourished throughout the 1800s in Britain brought a renewed interest in the art and architecture of the Middle Ages. It defined the architecture of the Victorian era, and has left a rich legacy of public buildings and churches. The stately homes and public buildings in the Scots Baronial style are an expression of the Gothic Revival in Scotland. The lost art of stained glass was needed once again to complete the neo-Gothic image. Attitudes in the Kirk had also changed, allowing Scotland to reconnect with its pre-Reformation heritage and bring stained glass back into its religious buildings. Just how the lost art of stained glass came back to Scotland is not known with any certainty. The lives of the early Scottish pioneers are not documented. However, they probably learned the craft in England, where it had not entirely disappeared. They also adopted the English style; there were no surviving examples of stained glass from Mediaeval Scottish churches or cathedrals on which to base their designs. The major source of reference material in the 1850s was a two-volume publication written in 1847 on the mediaeval stained glass that had managed to survive the Reformation in England. England had also endured a period of iconoclasm during its Reformation, though fortunately not as thorough as in Scotland. Alloway is fortunate to have a fine collection of stained glass in its church, dating from the Victorian era right up to the present century. However, elsewhere, Scotland’s heritage of Victorian church architecture and stained glass was sadly undervalued in the twentieth century. Glasgow’s heritage suffered particularly badly from the urban redevelopment programmes of the decades following the Second World War, which resulted in the demolition of many Victorian church buildings and the loss of many fine examples of early Victorian stained glass. Every year a team of volunteers keeps Alloway Parish Church open during weekdays (provided the church is not required for a wedding or funeral) throughout the summer months of June, July and August, so that visitors can enjoy the stained glass windows, and in particular the Robert Burns Memorial Window. This entry was posted in Local History and tagged Alloway, Alloway Parish church, Ayr, Ayrshire, Burns Monument, Robert Burns, Robert Burns Birthplace Museum, stained glass. #ilovemuseums because of the unique collections! A previous blog post looked at the ‘up-cycling’ of the press that printed Burns’s first collection of Poems Chiefly in the Scottish Dialect also known as the Kilmarnock Edition. The repurposing of the press happened in 1858 and it was turned into an arm chair. The chair became an ornamental and useful piece of fine oak furnature, that was a souvenir or relic of Burns’s inaugural work. This is not only one example of creating souvenirs or relics relating to Burns’s work and life from materials which are linked to aspects of his fame and life. At the Robert Burns Birthplace Museum and Bachelors Club, Tarbolton there is an amazing array of material! This blog post will look at a few highlights in the collection. From the passing of Robert Burns on the 21st of July 1796 at the age of 37 people wanted to own a piece of the man! Over the years after his death the “Burnsiana” grew and developed, the collection of Burns souvenirs is broad and includes material that has been up-cycled from other objects or materials include pieces of Burns Trysting tree made into collectables, hair jewellery made with pieces of Jean Armour’s hair and pieces of Burns’s kist/coffin. 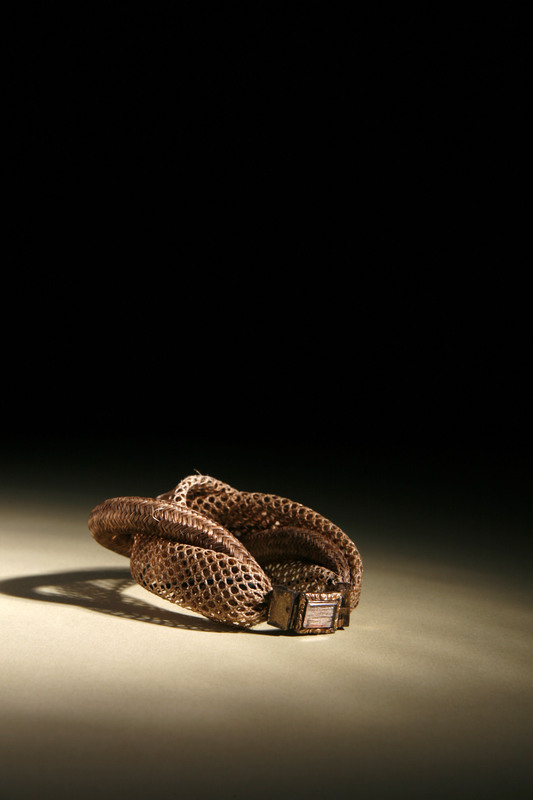 An interesting item in the museum collection is a necklace that is in the Fame section of the museum display. The necklace has 40 wooden beads and a wooden cross at the front with metal embellishments. 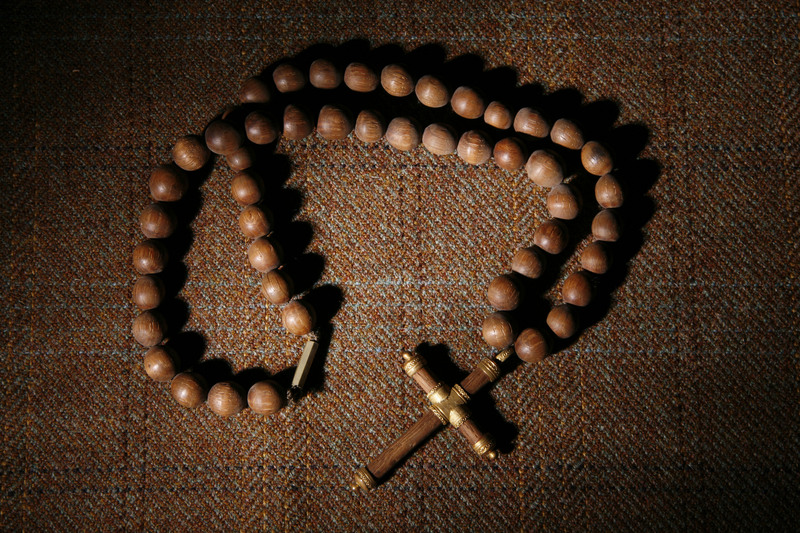 It is 54cm long and the wood used in the necklace was taken from the Auld Alloway Kirk, just a short walk from Burns Cottage and next to the Burns Monument. Necklace made from wood from Kirk Alloway. Object no. 3.4531. Alloway Kirk is a ruined church, which was built about 1516. By the time Burns wrote Tam O’Shanter the Kirk was in ruins. It had not been used for several decades and was in a ruinous state. There is little information within the object record other than that the necklace is dated to 1822 – which dates to when Burns Cottage was under the tenancy of John Gaudie, and when the Burns Monument was under construction. 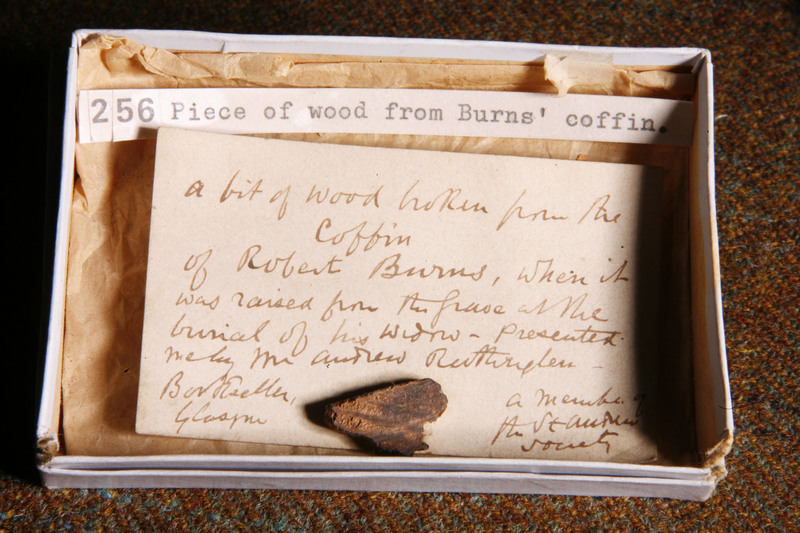 Other unique wooden souvenirs in the collection include a Pipe Case reportedly made from part of Burns’s Kist (3.4572), this is not unusual in the sense that it is connected with Burns’s burial – with the acquisition dated to 1834, below is an image of a piece of wood taken from Burns’s coffin when his tomb was opened so that Jean could be buried alongside him. As with many souvenirs or relics the authenticity of the object is unclear – in this case eyewitness accounts state that the coffin was intact. 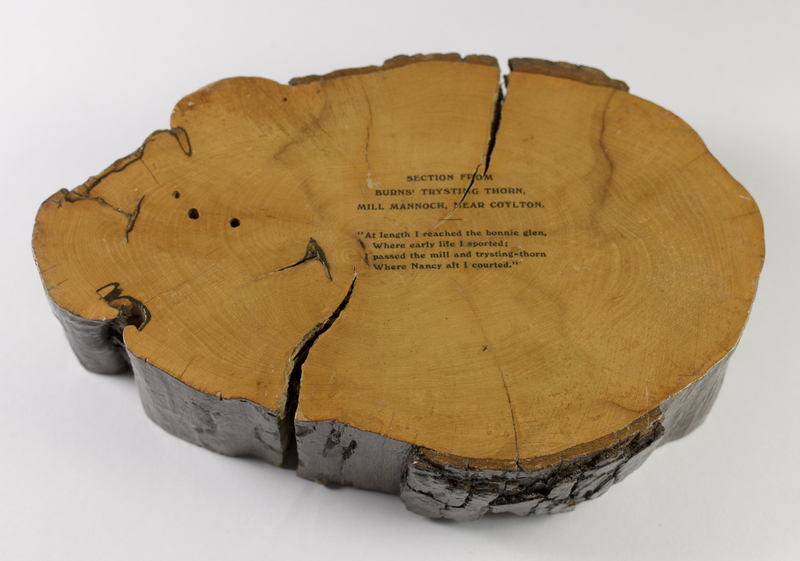 Wooden souvenirs with a direct connection to Burns’s life, made from the wood of trees grown on the banks of the Doon or, in this case, from the rafters of Alloway Auld Kirk, were highly sought after by Burns enthusiasts and general Victorian collectors. In the 19th century there was a real interest in relic collecting relating to contemporary Poets – for instance at Keats House, Hampstead has in the collection a Gold Broach with some of Keats’s hair displayed in it, c.1822 (K/AR/01/002); another relic kept by the British Library is Percy Shelley’s ashes set inside the back cover of the book Percy Bysshe Shelley, His Last Days Told by His wife, with Locks of Hair and Some of the Poets Ashes (MS 5022). 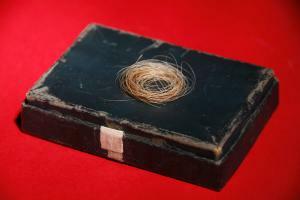 At RBBM we have a lock of our Poet’s hair which is said to have been snipped from Robert’s head shortly after his death by his wife, Jean Armour, and given to her friend Jean Wilson in Mauchline as a macabre souvenir. The world of Burns souvenirs and relics is vast and this only highlights some of the more unique… and interesting aspects of Burnsiana! Lutz,.D Relics of Death in Victorian Literature and Culture (2015). This entry was posted in Exhibition, Object Focus, Robert Burns and tagged 1796, 18th century, Alloway, Alloway 1759, Alloway Auld Kirk, Bachelors Club, Banks of the Doon, Burns Cottage, Burns Monument, Burnsiana, collections, death, Jean Armour, Relics, Robert Burns Birthplace Museum, Souviners, unique. 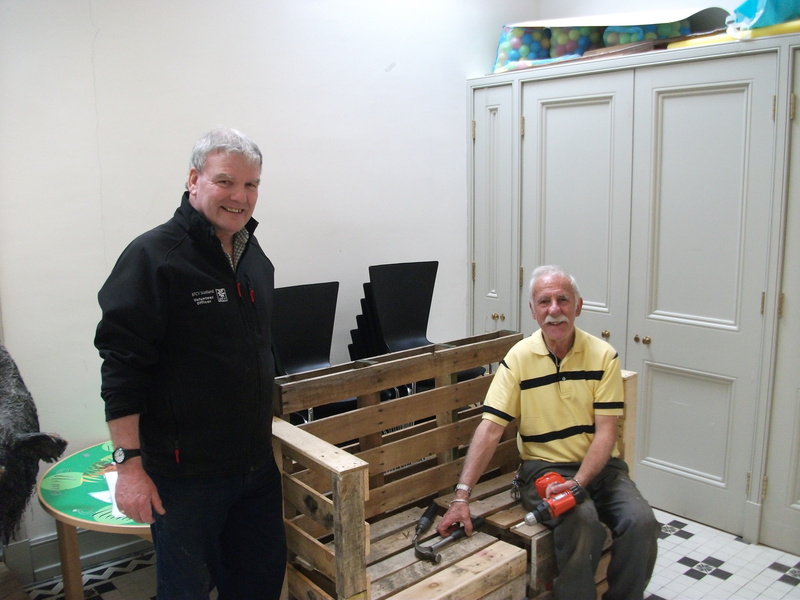 Roger with fellow volunteer Sandy working on a book bench! I retired from full time work 6 years ago and having spent the first 5 of those with The Conservation Volunteers, I came to the RBBM just over a year ago as a “Buggy” driver which involves meeting and greeting visitors, transporting them on the buggy between the Museum and Burns Cottage, or any other places the buggy will reach, and helping with other information and advice where I can. 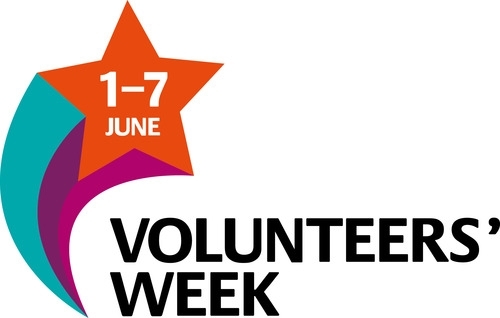 As with most volunteering the role rarely stops there and I now find myself helping out from time to time in all sorts of other ways which I find very rewarding , stimulating and helps me feel part of the team. Driving the buggy allows me to meet a whole range of interesting folk from all four corners of the planet and I am constantly amazed at how well Robert Burns is known even in the smallest and most remote of islands but these global travellers offer a wide range of stimulating conversation which is rarely restricted just to the “Bard”. The Volunteers at RBBM also help run a Garden shop, situated in the grounds of the museum, and a gift shop in the nearby town of Ayr which offers a wide variety of goods manufactured by local crafters and is also a shop window for the RBBM itself. 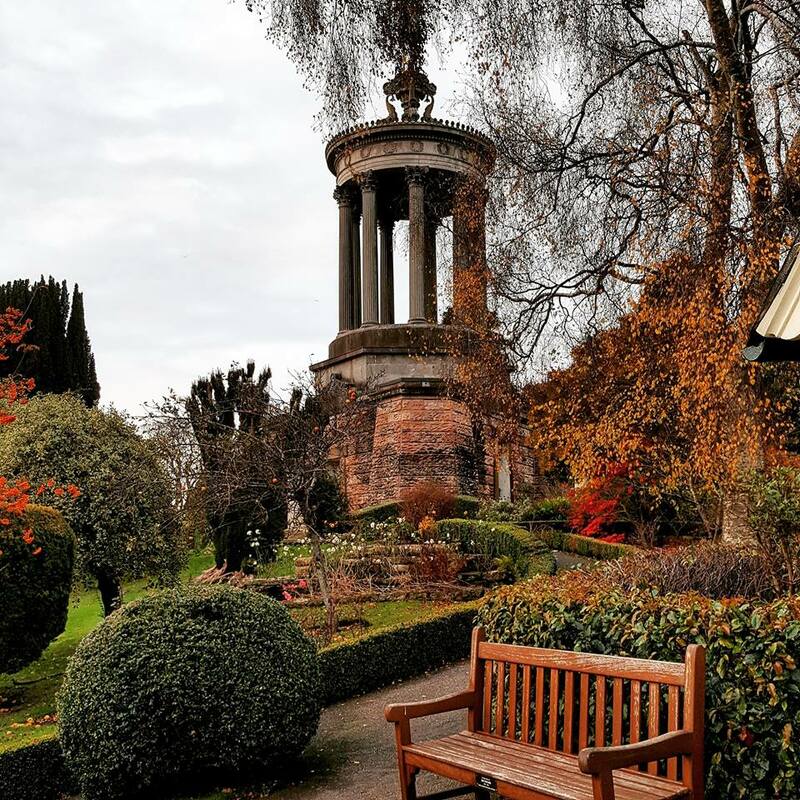 The main purpose though of both these venues is to raise funds for the restoration and improvement of the Burns Monument which is just one of the bold and innovative ideas being developed by the management team at RBBM. One variation on the theme, which I particularly remember, was the great fun we all had on Halloween: volunteers and staff together, creating and acting out a costume drama incorporating the Burns Cottage, Poets Path and “Auld Kirk” and providing lots of “bloodthirsty” and scary moments for those visitors brave enough to come back after dark ! I find volunteering a great way to keep fit, active ,meet new people and maintain a standard of life which rarely falters and you may go a long way before finding a better place to do all this than with the team at RBBM and the beautiful countryside surrounding it. This entry was posted in Volunteer Week 2015, Volunteers and tagged Alloway, Alloween, Buggy Driving, Burns Cottage, Burns Monument, Burns night, Friends of RBBM, global community, Robert Burns, Robert Burns Birthplace Museum, Volunteer Week 2015, volunteering, volunteers. The Glasgow Phoenix Choir visits Alloway! The Glasgow Phoenix Choir in full flow! Last week we were once again overwhelmed by the dedication and talents of our volunteers. 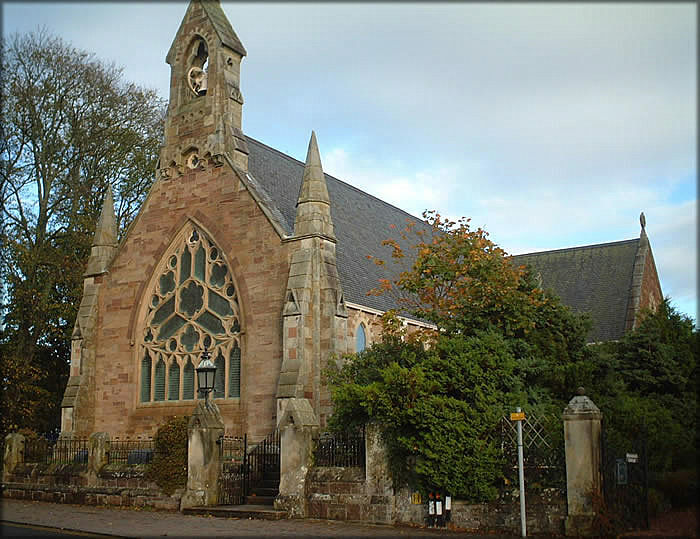 On Saturday 22nd February Glasgow Phoenix Choir held a concert in Alloway Parish Church and a special pleasure was the prominence of our own volunteer Billy as solo tenor. His rendition of Ae Fond Kiss was particularly moving. He also came up with the idea of bringing the choir to Alloway in the first place to raise money for the repair and restoration of Burns Monument. The choir looked stunning as they entered in their white tuxedo jackets and elegant black evening dresses – all seventy of them. The programme, led with great verve by Conductor Marilyn J Smith, was perfectly designed for the venue and audience with a strong theme of Burns and Scottish songs but also sacred and modern classics too. The church was packed and you could feel the warmth of the response to song after song. 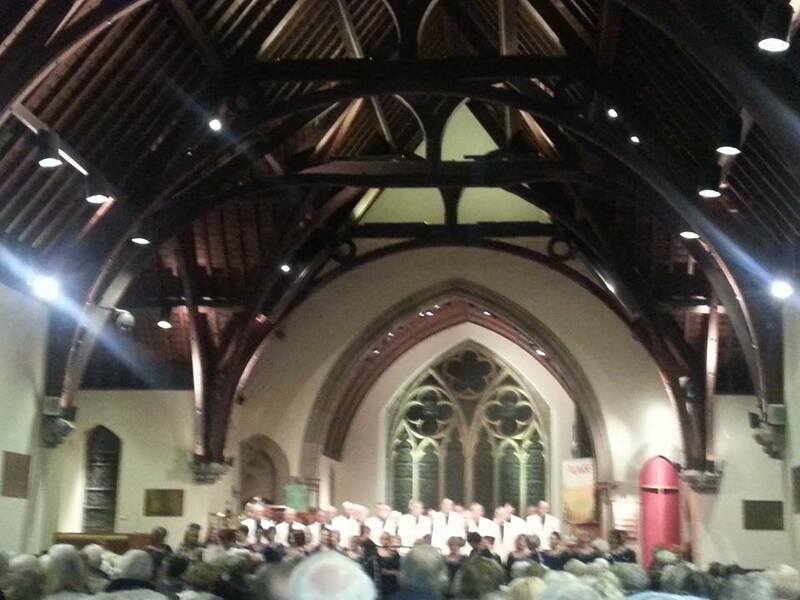 A Treasurer of the Friends of RBBM has let us know that the concert raised a significant sum! Many grateful thanks go to everyone who supported it by coming along, spreading the word and selling tickets to family, friends and neighbours and also ‘Team Sandwich’, the band of volunteers who spent hours beforehand buttering and spreading sandwiches for 70 people! Thanks also to the church representatives that were an invaluable help. And not to miss out the staff at RBBM who went above and beyond expectations in selling tickets and giving information. This entry was posted in Events and tagged Ae Fond Kiss, Alloway, Burns, Burns Monument, Friends of RBBM, Glasgow Phoenix Choir. Volunteers, Scotland.